Get involved in our Clean Air? - Take Care! campaign today. Clean Air? - Take Care! is a new joint initiative between the BSIF and the Health & Safety Executive (HSE) aimed at reducing occupational respiratory disease. Contact us directly or get in touch with your trade association to find out how to take part. 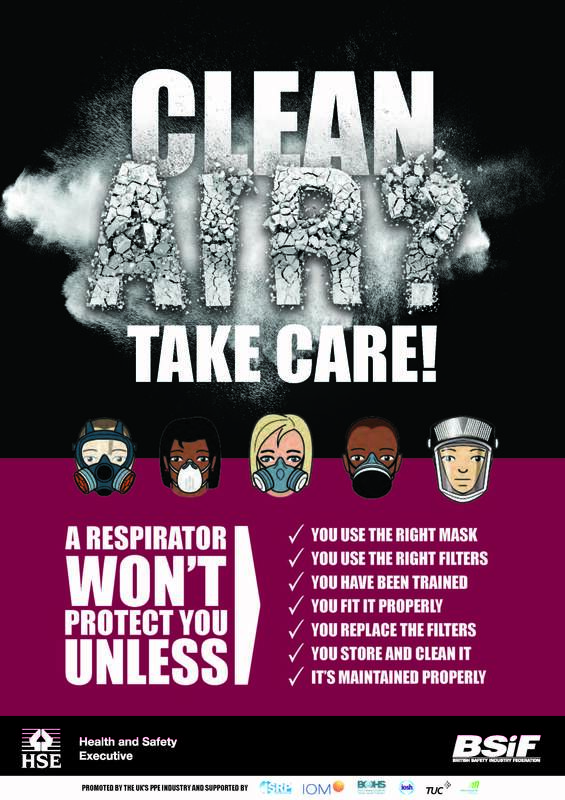 With your help we can highlight the problem of respiratory disease and promote sensible solutions to respiratory protection in the workplace. The initiative is centred on a range of national activities and educational seminars designed to raise awareness among RPE users, employers, fit testers and advisors on the correct selection, deployment, use, maintenance and storage of RPE. Click button below to view campaign leaflet in PDF format. Click the button below to view the presentation in PDF format.